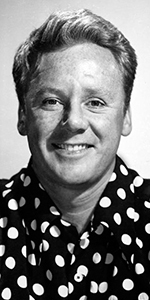 Van Johnson was a popular male lead in films, emerging during the war years. His good looks and son-and-dance-man vibe worked well with audiences, who thought of him as the "boy next door" who could sing and dance, but who could also struggle with the complexities of war. Born to a Swedish immigrant father and a mother of Pennsylvania Dutch heritage, Van lost his mother when he was a child. Raised by his father, Van began performing at the country clubs in Newport, eventually striking out for New York City upon graduating from high school. He joined the off-Broadway revue Entre Nous in 1935. He made his Broadway debut in the revue New Faces of 1936. Johnson knocked about for a few years, coming under the tutilage of George Abbott, where he began to understudy for the likes of Gene Kelly in Pal Joey from 1940 to 1941. While in Los Angeles, Johnson was taken to lunch by Lucille Ball, who introduced him to M-G-M casting director Billy Grady, who had him make screen tests around town. He was signed to Warner Bros., and did a few films there, but they dropped him after six months. M-G-M however, put the actor in the title role as Dr. Gillespie's New Assistant (which played the Chinese in May, 1943), where he played opposite Lionel Barrymore — who used to mentor Robert Young's Dr, Kildare. He went on to appear in The Human Comedy (played the Chinese in May, 1943), and Two Girls and a Sailor (played the Chinese in June, 1944). His real break came with A Guy Named Joe with Spencer Tracy (which played the Chinese in March, 1944). During production, Johnson was in a car crash which almost took his life; M-G-M wanted to replace Johnson in Joe, but Tracy insisted they wait for him to recover; the film became a big hit, and with Johnson excused from war service due to his accident, he became one of the few male leads in Hollywood during the latter war period. Johnson's persona alowed him to appear in war films — as in Thirty Seconds Over Tokyo (released in November, 1944, or in musicals — like Easy to Wed with Esther Williams (released in July, 1946). This leapfrogging continued with the musical Till the Clouds Roll By (released in January, 1947), the comedy State of the Union (released in April, 1948), the war film Command Decision (released in February, 1949), the musical In the Good Old Summertime (released in July, 1949), the war films Battleground (released in January, 1950), and Go for Broke! (released in May, 1951), the musical Easy to Love (released in December, 1953), and Brigadoon (released in September, 1954), after which M-G-M dropped Johnson along with many other contract players from their contracts. Perhaps his signature performance came as the second in command during The Caine Mutiny (released in June, 1954). He received rave reviews for his work in this film. He famously appeared as himself on I Love Lucy on CBS in May, 1955, then got back to work in films: Miracale in the Rain (released in April, 1956), 23 Paces to Baker Street (released in May, 1956); but The Pied Piper of Hamlin was a television musical version of the story with Johnson in the title role. It was shown over NBC, in November, 1957. Johnson did a lot of television, appearing on Zane Grey Theatre in 1959, General Electric Theatre in 1960, The DuPont Show with June Allyson in 1960, Ben Casey in 1965, Nanny and the Professor in 1971, Love American Style in 1971, Maude in 1972, Rich Man, Proor Man in 1976, Quincy, M.E. in 1977, The Love Boat in 1982, Murder She Wrote in 1990, and so on. Johnson returned to the stage as Harold Hill in a production of The Music Man in London's West End in 1961, which played for almost a year. Films he did during that time include, Where Angles Go, Trouble Follows! (released in April, 1968), Yours, Mine and Ours (released in April, 1968, Concorde Affair 79, (released in March, 1979), and The Kidnapping of the President (released in August, 1980). In 1985, He took over in the lead role of Georges in La Cage Aux Folles on Broadway, and appeared in The Purple Rose of Cairo (released in April, 1985). In 1991, he played the role of Captain Andy in a touring revival of Show Boat. His last film was Three Days to a Kill (released in November, 1992). Johnson lived in a posh Manhattan penthouse until 2002, then moved to assisted living in Nyack, New York. He died of natural causes in December 2008. He was 92. Grauman's Chinese Theatre, Hollywood, California. Van Johnson Forecourt ceremony, Thursday, March 25, 1948. 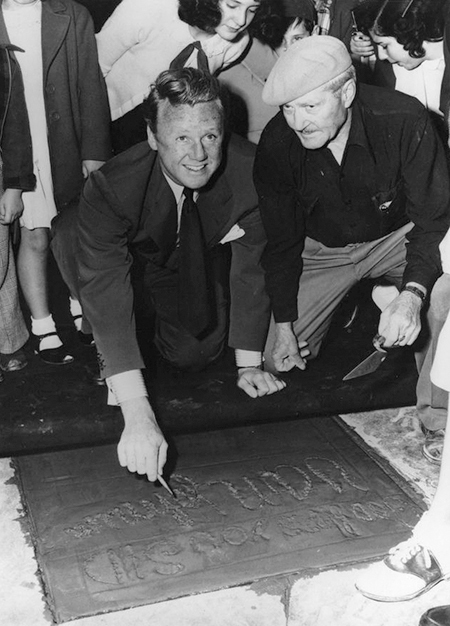 Van Johnson makes his autograph with cement artist Jean Klossner looking on.